Subalpine, alpine. 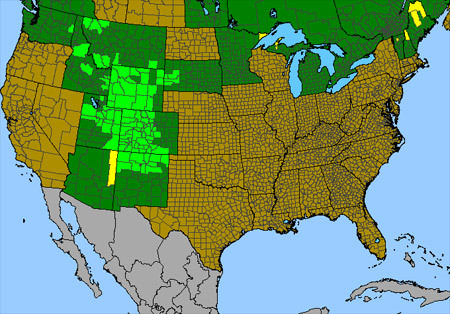 Tundra, meadows. Summer. Above:Lake Hope Trail, August 11, 2009 and U.S. Basin Road, August 4, 2015. 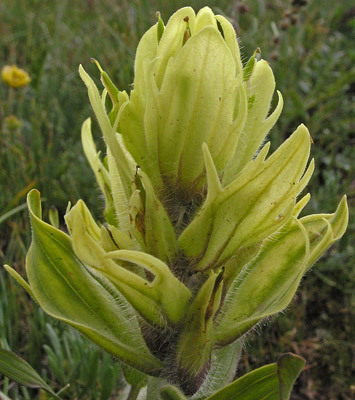 Castilleja occidentalis is very similar to its taller cousin, Castilleja septentrionalis, shown below. 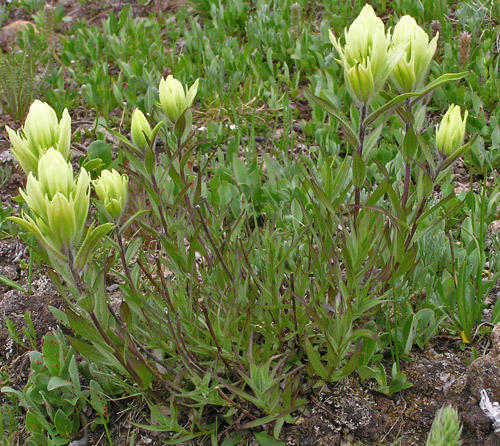 Several factors help to distinguish between the two: C. occidentalis almost always grows on tundra, is quite short (to about eight inches tall), is a very pale yellow, and leaves and bracts are lanceolate. 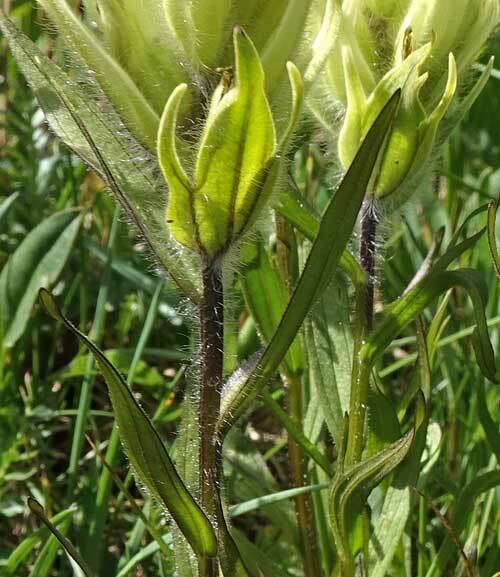 C. septentrionalis most often grows in subalpine meadows (often in extensive numbers) to about fifteen inches tall, is a lemon yellow, and has linear lanceolate to more broadly lanceolate leaves and bracts. 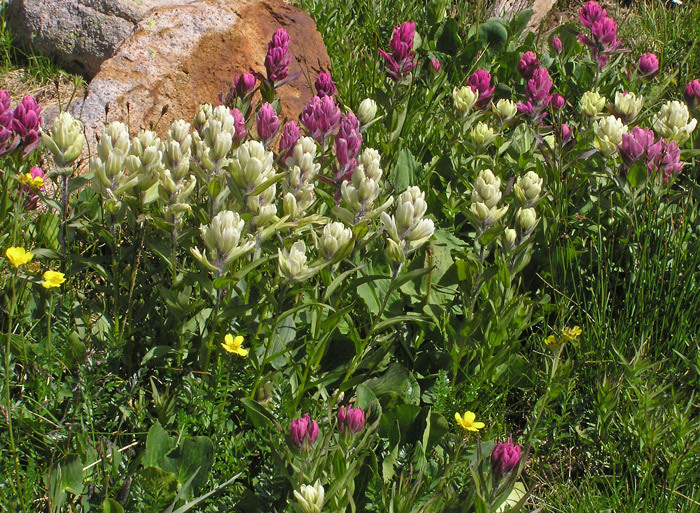 Overall, though, the plants are so similar that Intermountain Flora states, "Castilleja occidentalis often appears to be a dwarfed alpine form of the taller subalpine C. septentrionalis". Stanley Welsh (A Utah Flora) considers C. septentrionalis a variety of C. rhexifolia. The three species are so similar that future research may indicate that they are all the same species or varieties of one species. The top photograph above shows an almost white C. occidentalis and C. rhexiifolia. 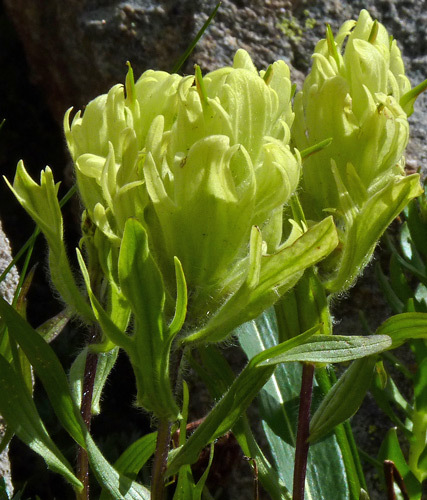 John Torrey named Castilleja occidentalis in 1827 from a specimen collected by Edwin James, probably on Pikes Peak in 1820. "Occidentalis" is Latin for "western". Lizard Head Trail, July 11, 2008 and U.S Basin, July 29, 2016. 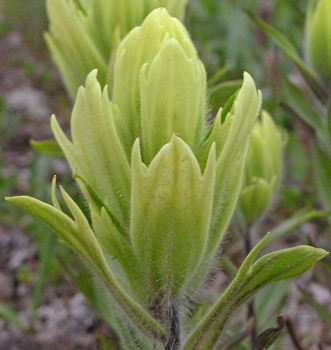 Castilleja occidentalis grows to about 8 inches tall in tight groupings of a dozen or so stems. Leaves are one to two inches long (generally of the shorter length near the base of the plant), linear to lanceolate, sessile, hairy, and entire (although sometimes lobed). 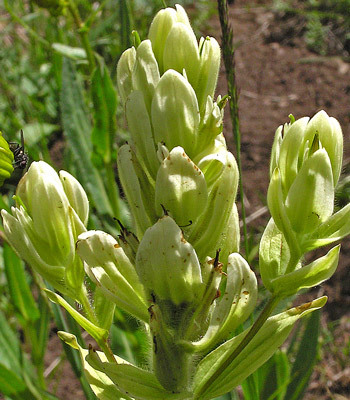 Bracts are broad and usually entire but commonly lobed. Lake Hope Trail, August 6, 2010 and Lizard Head Trail, August 18, 2005 and July 11, 2008. Calico Trail, July 14, 2004. This delicately colored paintbrush ranges from a light yellow to yellow/white. 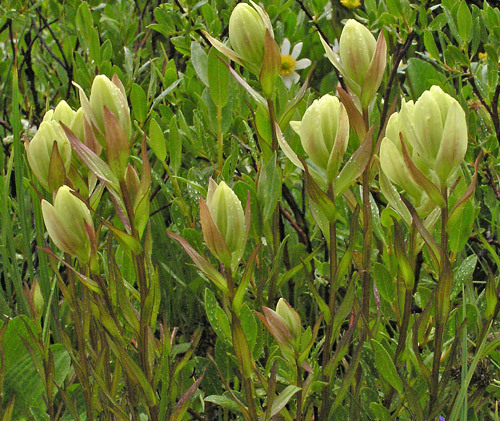 The plant in the photograph is just beginning to show color in its uppermost bracts. Plants grow from ten to twenty-four inches tall. 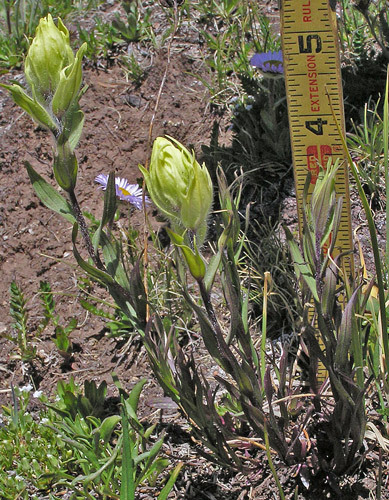 C. septentrionalis is taller than its more alpine cousin Castilleja occidentalis which grows to about eight inches tall. 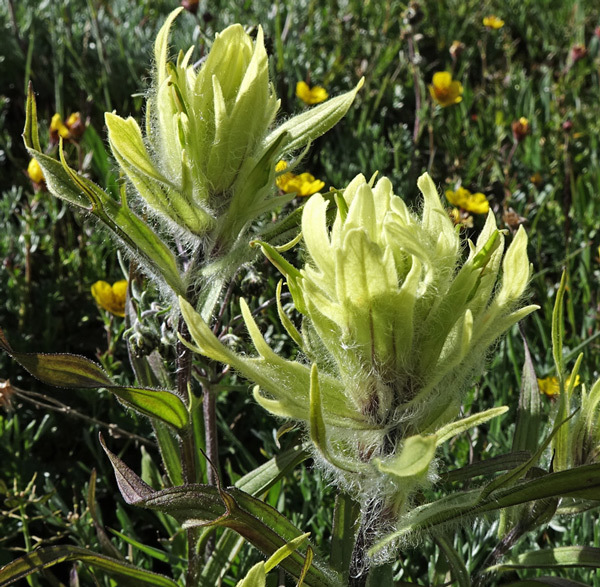 Stanley Welsh, Utah flora expert, places Castilleja sulphurea (C. septentrionalis) as a variety of Castilleja rhexiifolia. Per Axel Rydberg named this species in 1900 from a specimen collected by Rydberg and Bessey in Yellowstone National Park in 1897. Kilpacker Trail, August 29, 2005. 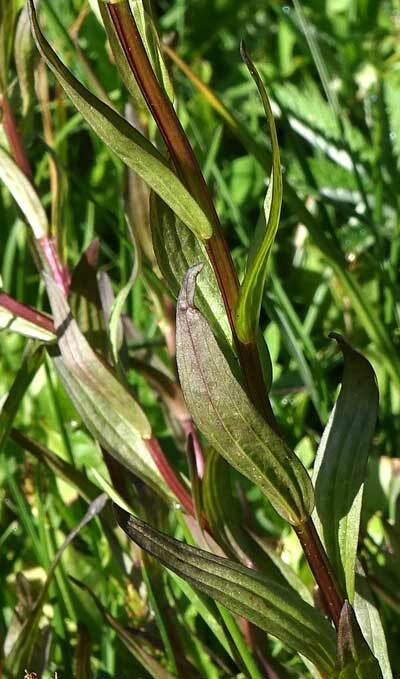 Stems are strongly red to maroon. Leaves have tinges of maroon, are almost linear to more broadly lanceolate (as shown at left), commonly are spreading or ascending (as shown at left), and prominently veined.